Kristy's Awesome Surf Adventures: Back In San Diego! I just got back from doing a surf tour over the New Years week in Mazatlan, Mexico. It is nice to get back to San Diego and this weather is such a pleasant surprise! The days are warm, lovely Santa Anna winds and plenty of sunshine. Now this feels like Southern California! This weather has been perfect for Stand Up Paddling and I have spent the days since I have been back SUPing the pier at Imperial Beach and the San Diego Bay. Perfect half foot waves and glassy conditions, exactly what I look for when I want to surf on my SUP board. 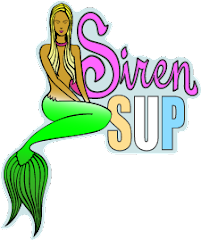 I have a new board on the way, so stay tuned cause next week I am headed to the Channin/Siren surfboard factory to pick it up! It is going to be quite an exciting moment, nothing better than picking up a new board! UUUHHHH! I am insanely jealous...I want a board so badly...I keep looking around my house thinking, "What could I sell?!" lol Let's talk more about this because I am serious about getting one...So good to see you. Wish we could have gone SUPing together!